I wanted to say, I REALLY miss the great weekly workouts that used to be on the website. Never failed when I was in a rut and didn’t have time to write up a class, I’d get an email that there was a new one posted. You do an amazing job and I’ve bought all your manuals. Sometimes those extra workouts are a God send! I know we haven’t been publishing as many workouts lately. That’s actually been intentional as we’ve been trying out some different articles with lists of drills and advice on planning out your sessions. We also published about 20 workouts in our competition last Feb/March. If you’ve been enjoying these style of posts, scroll to the bottom of this workout and let us know in the comments. If you miss the workouts like the one below, tell us that too! Myself and the other contributors want to keep giving you what you want and need to help with your group fitness business. Today I will be returning to our old style of article by sharing a workout. In this workout I really wanted to include some kind of hill sprints (I’ve been loving putting them in this summer) but I knew that 10 sets of short hill sprints would probably only take 5-10 minutes. So I built the rest of this workout around them. For a workout 60 minutes long. Start with a warm up and game before doing this workout. A hill; with a cone a the bottom and a cone at the top for clients to sprint between. Place the battling rope in a straight line on a field around 100m wide. If your field is bigger, use cones to set out a start and end point. Set up bands and mats for the band station. Find a bench or high step that clients can run to and use. This workout uses four different drills and requires your group to split into teams of 2 to 4 people. If you have more than 4 teams you will need to make sure you have enough equipment for multiple teams to be at each drill/station. This is the kind of workout where you just need to explain it once at the start of the workout and then unleash your clients on it (provided you have a whiteboard for clients to refer to). This leaves you to actually coach your clients and motivate them, rather then explaining and demonstrating the next thing. For this workout, teams need to complete all four of the drills twice in any non-consecutive order ie. they cannot complete the same drill twice in a row. They can do the drills in a circuit, ‘superset’ drills or just go to the next available drill that is not being done by another team. Pretty self explanatory, sprint from the bottom of the hill to the top. Walk back down slowly. Clients should have mostly caught their breathe by the time they reach the bottom. The team lines up along the rope and carries the rope to the other side of the field. Once there they drop the rope on the ground in a line and do travelling jump squats up and down the length of the rope. Then they pick up the rope, run it back to where they started, pop it on the ground in a line again and do bear crawls. Each team member completes this circuit once (at the same time). Do 12 reps per exercise. L+R=1 on the lunges. Band Push Ups – place band behind your back, bring it around your side and cross the bands over, holding on place the bands under your hands. Complete a push up as normal. Band ‘Goblet’ Squat – get ready to do squats with the band under both feet. Hold handles in front of your chest like you are doing a Goblet Squat. Band Rows – grab someone from your team to hold the middle of the band while you do rows. Swap positions after completing all 12 reps. Band Lunges – you’ll need to do all reps on one side and then the other. Get in a lunge position, place band under your front foot and hold band ends up near your shoulders. On this drill we’ll do pyramid reps. Start with 1 rep and add 1 more each round until you reach 5 reps, then go back down to 1 subtracting 1 rep each round. Got questions about this workout or the exercises? Ask them in the comments below and I will reply. And don’t forget to let us know whether you like the posts we’ve been doing lately or want more workout examples. Right now we’re opening the doors to our live course, 31 Days to a Better Bootcamp Business. If you feel like your business has become stagnant over the past few months, this is just the focused step by step jump start your business needs to get back on track. Read the details here. 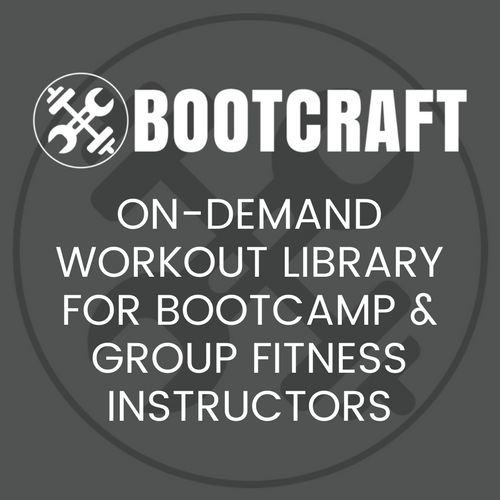 Get updated when new workouts hit Bootcamp Ideas and also get access to over a dozen workouts, a sample PAQ and the bootcamp trainers checklist. I miss the workouts too! I agree with the commenter. The new workouts were always great to help keep things fresh and mixed up. I miss the workouts too, but do enjoy the other posts as well. A mixture would be awesome! I love it all! I am really enjoying your new posts, however I must admit I miss the workouts! I would get the email notification and would sneak off for a bathroom break just to see it!! 🙂 You are awesome! Hey Kyle, totally agree with the other comments, the weekly workouts have often helped me out of a tight spot. It’s so easy to get caught up in the daily grind then suddenly think “Oh crap I need a workout for tonight”. A big thanks to you and the other contributors for helping us all. I kind of miss the weekly workouts too. They were like a weekly motivator for me to get re-energized for my clients. I do definitely still follow all your posts and love the great energy and passion that come through each week! I loved the weekly workouts! I have used so many of them or at least ideas and love how the ideas get my own creative juices flowing. Thank you!! I also miss the weekly workouts! Love them!